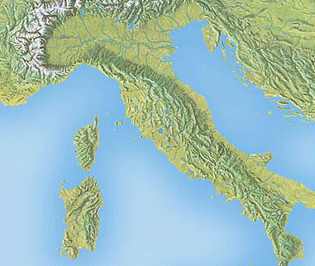 Section of a natural-color map showing Italy, painted by Hal Shelton around 1968. Hal Shelton is a cartographer most notable for his natural-color maps done for Jeppeson Map Company in the 1950s and 1960s. Unfolded Dymaxion Map (dashed lines indicate fold points) by Eric Gaba, 2009. 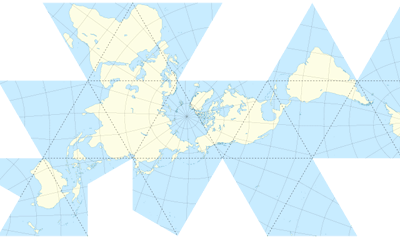 What makes the Dymaxion map project unique is that the Earth is projected onto the surface of an icosahedron, a polyhedron that is comprised of twenty triangular faces and thirty edges. 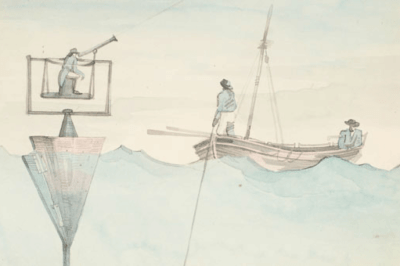 Drawing from 1812 by William Chavasse proposing an anchor system to provide a stable platform for using at telescope at sea for determining longitude based on the position of the moon and the stars. The Board of Longitude determined this method to be unworthy. The 300-year-old archive of the Board of Longitude has been scanned and made available to the public via the the Cambridge Digital Library. 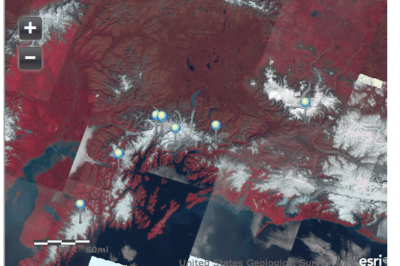 Until August 21, 2013, the public is invited to comment on the Federal Geographic Data Committee’s (FGDC) draft strategic plan for the National Spatial Data Infrastructure (NSDI).